The Argentine warmed up for the Clasico with a football masterclass against Manchester City that will leave Carlo Ancelotti concerned ahead of Sunday's crucial clash. Even Pep Guardiola could not hide his delight. The Catalan coach was back at Camp Nou for the first time since he quit as the Barcelona boss in 2012 and even though he was there in a professional capacity to scout possible rivals for Bayern Munich in the Champions League quarterfinals, his admiration for Lionel Messi was crystal clear. 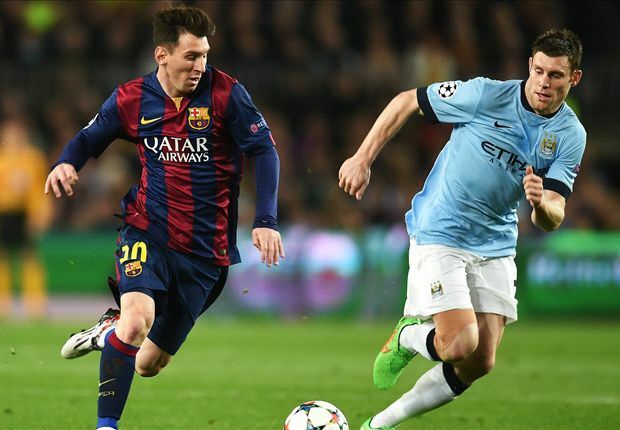 Guardiola gasped in amazement as Messi nutmegged James Milner late in the first half, covering his face in disbelief at the sheer brilliance shown by his former player. And when Messi's majestic run and perfect pass set up Ivan Rakitic for Barca to take the lead, the Bayern boss stood up in appreciation, this time pulling his sweater up over his mouth - no doubt to cover up a celebratory cry or a poetic platitude to the world's finest footballer. And who could blame him? After Guardiola's great Barca side thrashed Real Madrid 5-0 in November 2010, Pep was asked if the Argentine, despite not scoring, had given his most complete performance yet for the Catalan club. 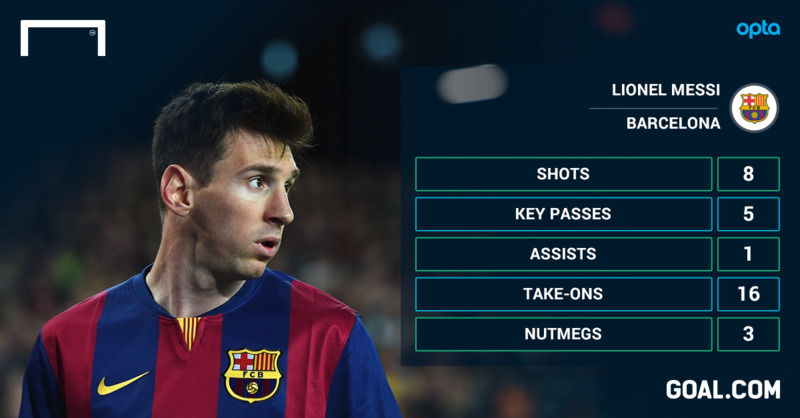 "Messi is always complete," he said. But four and a half years on, he has now surely witnessed the Argentine in his most complete version. Against City, Barca's fantastic forward was omnipresent in the Blaugrana's best play. Fired up by his penalty miss in the first leg last month, the 27-year-old tore City apart with mesmerizing dribbles, pinpoint passes and wonderful vision. One remarkable run in the first half was wasted as Neymar misplaced a routine pass, but Rakitic made sure the Argentine's vision was rewarded later on as he lobbed Joe Hart to give Barca the lead. Meanwhile, the 27-year-old also whipped two fantastic free kicks onto the roof of the City net. In the second half, he almost added another wonder goal to his growing collection of spectacular strikes as he cut inside with a dazzling dribble and was denied virtually on the line by Hart. There was talk at one point that an impressive performance by City in this tie could convince the Argentine to sign for the current Premier League champion. But on this form, he will never ever want to leave the Catalan club and the fans who chanted his name again on Wednesday would stand a sit-in protest to stop such a scenario in any case. Not that it will happen any time soon. City is no better than last season's side beaten 4-1 on aggregate by Barca in the last 16 of the Champions League, while Luis Enrique's men have now won 27 of their last 30 games in all competitions and, as Guardiola used to say, there are now no adjectives left to describe Messi. Next up is the Clasico against an inconsistent Real Madrid side at Camp Nou on Sunday and on this evidence, the world and European champions will be up against it in the Catalan capital. Los Blancos not only have to beat Barcelona to regain the lead in La Liga, but they must also somehow stop Messi in his most majestic form. It's a huge ask.